When it comes to Arizona copier sales, Arizona Copiers is the premier source for top of the line multifunction copiers from trusted brands such as, Konica Minolta, Toshiba, Lexmark, Muratec, Hewlett Packard, and Kip. Our main goal is to provide the very best in Arizona copier sales options, allowing businesses to fulfill their unique copier needs at a price point that fits their budget. 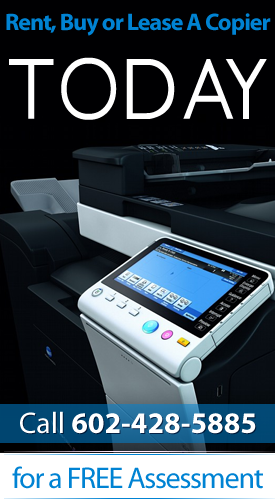 Today’s copiers are equipped with a number of features, such as touch screens with easy to navigate menus, lightening fast printing speeds, and faxing and scanning capabilities, making it easy to save time and money when you have a high quality printer in your office. Our copiers are easy to use, requiring very minimal training time, and will allow your company to take care of all of your document services in-house. Over time, a copier will pay for itself, as you will no longer have to use outside sources for all of your document needs. You will not find another copier company in Arizona that provides the highest quality copiers, super competitive prices, and exceptional customer service! At Arizona Copiers, we take great pride is assisting our customers in finding the ideal copier to fit the needs of their office. Our experienced representatives are always available to answer questions, provide support, and help you compare different models of copiers side by side. Owning a copier provides a company with so many benefits, including the ability to create professional grade documents, brochures, and advertising materials with a touch of a button. You will be amazed by the quality of prints that our copiers create; whether you are making a high resolution black and white copy, or a vibrant color copy, you will notice the difference when you are using a superior copier from one of the top brands in the industry. In addition, our many of our copiers are also scanners and fax machines, allowing you to take of a multitude of office tasks with just one machine! If you are searching for a copier company in Arizona that offers unmatched Arizona copier sales options, we invite you to contact us today! Our copier sales services are available across the state, from Flagstaff to Phoenix, and down to Tucson. Between our inventory of remarkable copiers and a team of dedicated staff members, we are confident that we can help you choose the perfect copier for your office. Our services do not end after your purchase is completed- we are always available to offer customer support, and to answer any questions that you may have about the copier that you purchased.